Think you don’t have time for breakfast? Here’s why you should work it in: Without enough calories in your system, you’ll feel (and act!) like a zombie until lunch. Try this 2-minute, hot-and-cheesy egg sandwich. Crack an egg into a bowl, toss the shell, and scramble the egg quickly with a fork. Microwave it for 45-60 seconds. 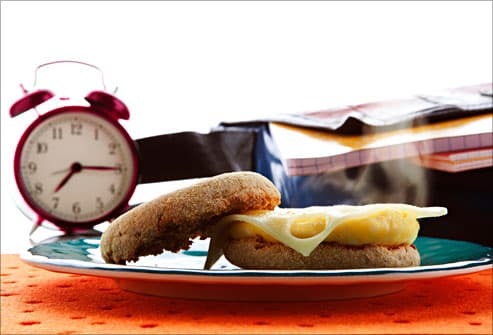 Toast a whole-grain English muffin -- then tuck in the warm egg and a slice of low-fat cheese. Boom! Breakfast. Sounds like dessert, right? This quick parfait tastes like one, too. 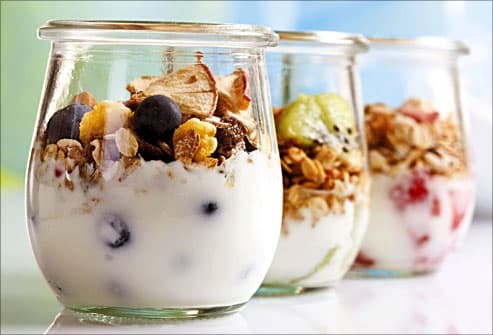 Dish out 1 cup of low-fat plain yogurt, 1 serving of cereal, and a handful of fresh fruit. You'll get protein, some healthy carbs from the cereal and fruit, and a little fat -- a good mix for lasting energy. 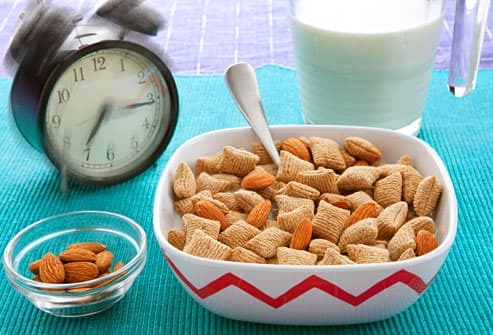 Keep it smart: Choose low-sugar, whole-grain cereal. Check the label and aim for 8 grams of sugar or less per serving. Be careful with granola – it sounds healthy, but it can have a lot of sugar. This protein-packed breakfast is microwave magic. Take a whole-grain flour or corn tortilla, then add 2-3 tablespoons of shredded low-fat cheese and a half-cup of canned beans. Black beans or pintos are great, just quickly rinse and drain them. 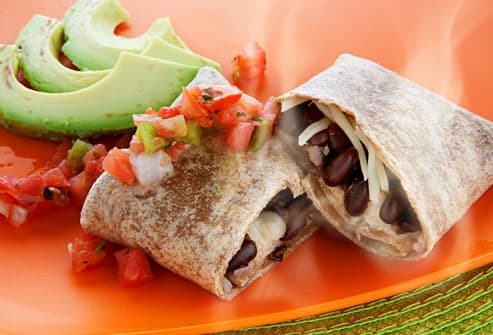 Heat your burrito for 30 seconds, then top with salsa or avocado slices. Swap in a scrambled egg for the beans, if you like. Measure the cheese a few times, and then you'll be able to eyeball the right amount easily. Who says you can't eat lunch for breakfast? Here's one you can make the night before and stash in the fridge. 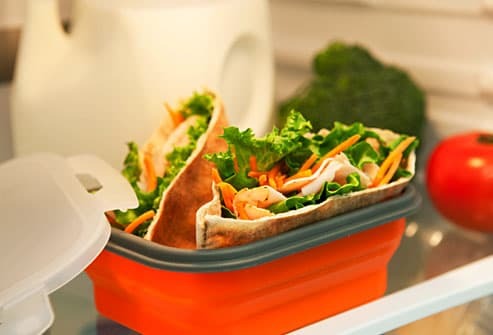 Take a whole-wheat pita, then add a slice of low-fat cheese, lean turkey or ham, and crunchy lettuce or shredded carrots. Try some hummus or a few avocado slices, instead of mayo -- you'll get great taste without the unhealthy saturated fat. 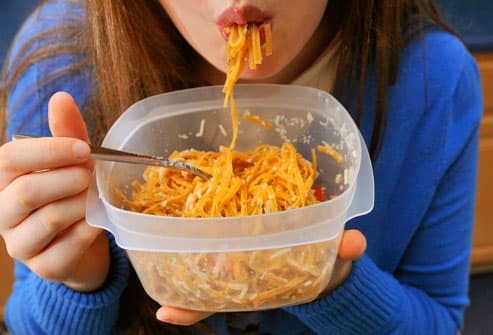 You've probably seen your parents do it, and it's not a bad idea. Grab some of last night's dinner and call it breakfast. Maybe it's rotisserie chicken with brown rice, or meatloaf with potatoes. Maybe it's spaghetti with meat and veggie sauce, warmed in the microwave. Avoid anything fried or really greasy -- fatty food is tough on an empty stomach and not so great for your health, either. Running late? 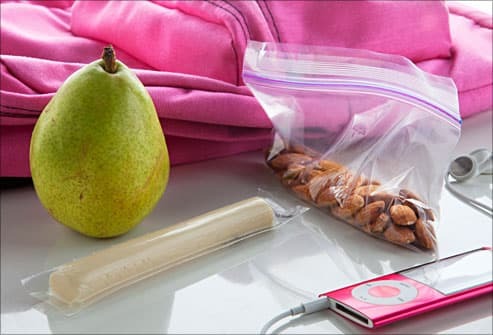 Even a super-fast breakfast you eat in the car or on the bus can be healthy. Grab a piece of fruit -- like a banana, apple, or pear -- and a piece of low-fat string cheese. For extra energy, add some almonds, peanuts, or cashews. Don't go overboard, though: A serving of nuts should fit in the palm of one hand and be about the size of a golf ball. Cereal to go? Take it in a snack bag, with a side of yogurt. 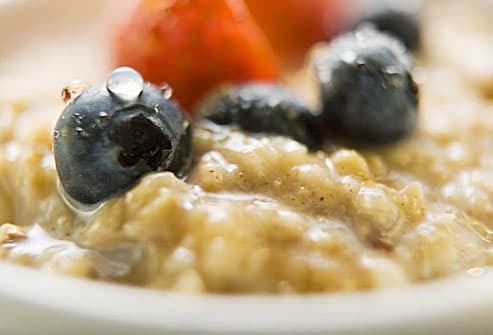 Make breakfast for the week on Sunday night: a big batch of steel-cut or rolled oatmeal -- sweetened with some frozen or dried berries. Keep it in the fridge and then warm a bowl in the microwave each morning. Flavored instant oatmeal can be a smart breakfast, too, if you mix half of a flavored packet with half of a regular, no-sugar packet. To get more calcium for your bones, make it with milk instead of water. Nut butters give you protein for energy and brain power -- and they can keep you fueled for hours. So spread 2 tablespoons of peanut or almond butter on your morning toast instead of butter or cream cheese. 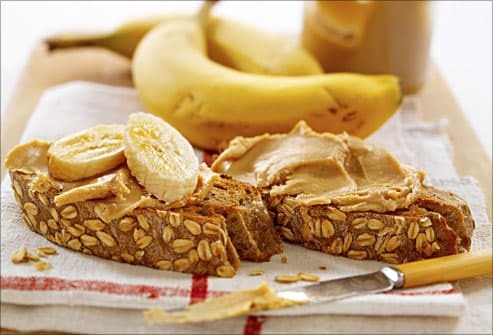 Try whole-wheat bread, and add banana slices to help you stay full longer. 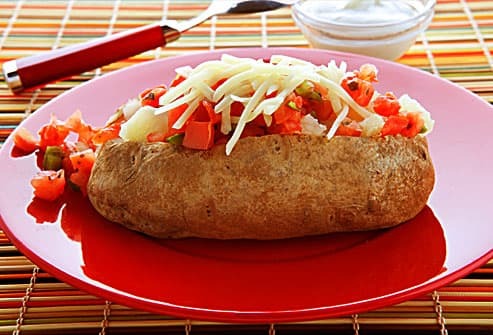 Potatoes give you carbs for energy and a little protein. Cheese or yogurt adds more protein, and salsa adds fiber. This power combo gives you energy for a morning swim practice or a pop quiz. But skip the butter or sour cream. How can you tell a good granola, cereal, or energy bar from a bad one? 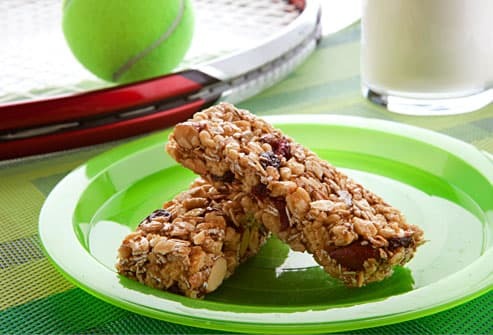 Look at the ingredient list: If you see fruit, nuts, oats, or other whole grains listed up top, that's good. If you see any sugar, syrup, or fructose listed first, that's bad. Look for at least 3 grams of fiber. Avoid any bar coated with yogurt or chocolate -- that's just a candy bar in disguise. Wash it down with a glass of skim, almond, or soy milk. Pair it with a box of 1% or nonfat milk, or just 1 cup of calcium-fortified orange juice. Tip: Avoid dried fruits made with added sugar or those fried in oil (banana chips!). Andrea N. Giancoli, registered dietitian, nutrition policy consultant, California Center for Public Health Advocacy; spokeswoman, American Dietetic Association. ChooseMyPlate.gov: "Foodapedia," "What Counts as a Cup of Dairy?" PBS.org: "Breakfast On the Go: Egg Muffin Sandwiches." Cleveland Clinic: "The Whole Truth and Nutting But the Truth." EatRight.org: "Breakfast: The Key to Learning," "Best Breakfasts for Your School Crew," "Healthy Weights for Healthy Teens," "The Surprising Avocado," "Alternatives to Butter," "Choosing Cereal and Sweetening the Deal." Hellmans.com: "Hellman's Real Mayonnaise, Nutrition Facts." 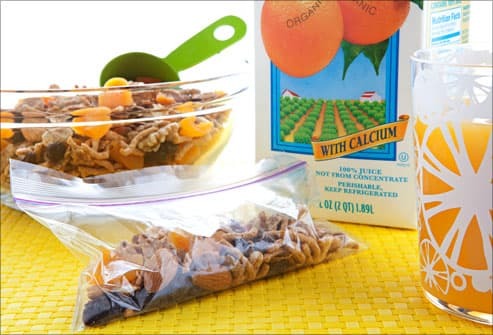 KidsHealth.org: "Yogurt Parfait," "Kids and on-the-Go Nutrition," "Home Alone Recipes: Trail Mix." Oregon State University: "Cooking with Kids: Healthy Egg Sandwich." Rachel Johnson, PhD, registered dietitian, University of Vermont, Burlington; spokeswoman, American Heart Association.